Google Chromecast is an innovative solution to watching videos, movies, photos, games and other content from supported apps on your TV for a big-screen experience. This arrangement uses your iOS or Android device as a remote control. You can even send content from Chrome web browser on your PC using Chromecast technology. Many modern mobile apps support this unique technology of casting media content on TV. With these apps ending up straight in your device and TV, you can increasingly feel more in control of what it is you would like to binge watch and when. Check out this list of best Chromecast apps for Android and iOS that make the experience even more interactive and powerful. People who juggle from one internet media to another really know what Netflix is all about. The app is so popular that it appeals to almost all age groups. . This Chromecast app tops the chart, offering subscribers flexible services and high-quality entertainment on their smartphone and desktop which includes thousands of movies and TV shows. With its Chromecast support, Netflix allows subscribers to cast the latest episodes and movies swimmingly to the big TV screen for more gratifying experience, something they can’t have on limited smart phone or desktop screen. They can leverage their mobile device for remote playback control. 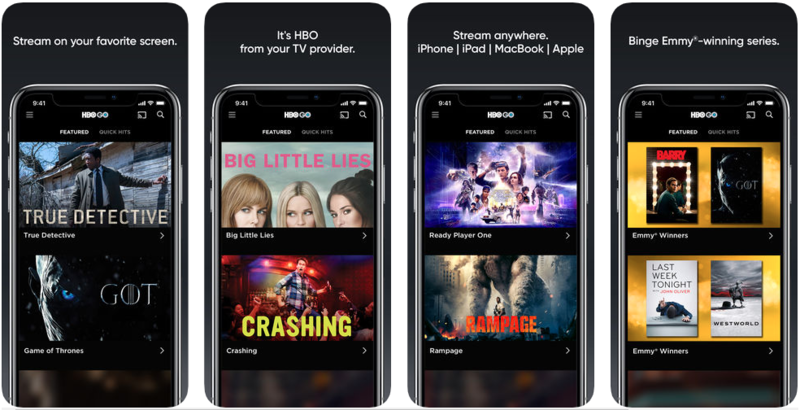 HBO Go provides stunning luxury of letting users stream their favorite HBO content right on their Android and iOS device so that they can enjoy all the latest HBO’s original TV shows and movies. Some of the shows that are making rage are Silicon Valley, Game of Thrones, True Detective, etc. To use this, users first should have a cable subscription to access its content along with extra features. You can also separately choose HBO Now direct streaming which liberates you from mandatory cable subscription. Hulu Plus is another subscription-based service that lets you follow your favorite current TV show episodes from popular channels like ABC, Fox, Comedy Central, NBC, BBC and more. You can watch some after a day the episode is aired. 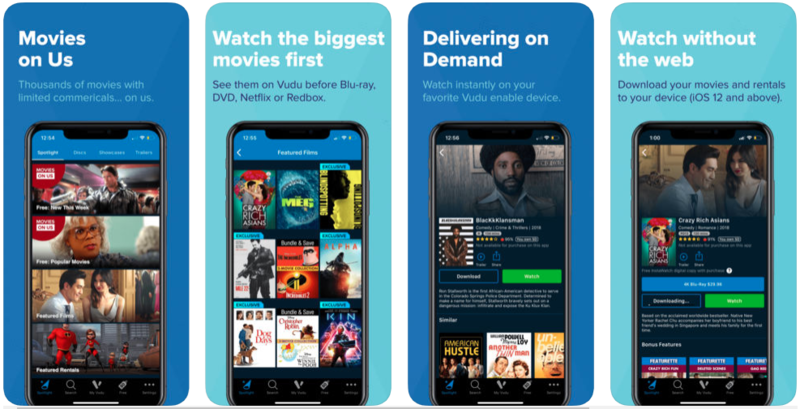 If you are a fan of Agents of S.H.I.E.L.D., Family Guy or A Day in the Life, Hulu Plus has simple and economical way to offer convenient viewing. You can also watch latest movies and Chromecast enables seamless experience on your mobile device, PC or TV. 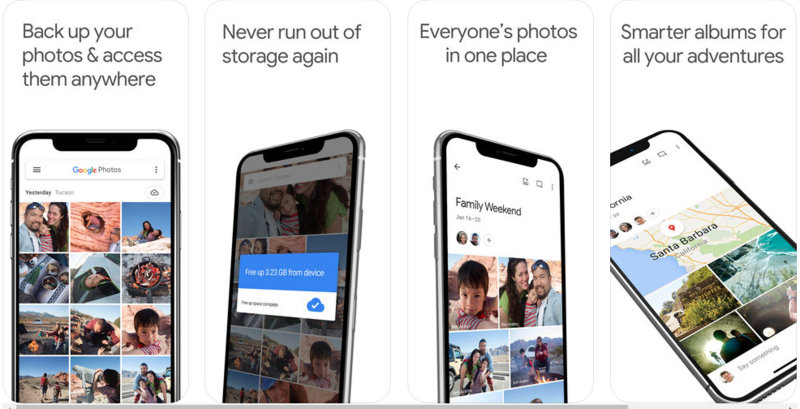 Google Photos is the most preferred app on mobile for backing up the visual data catalog such as personal photos and images. It has Chromecast functionality which makes it possible for users to browse and view private Google photos on their TV screen. This is an officially available option along with other alternative options which also works without backup functionality. Spotify can be easily translated into Online music streaming experience since it is greatly usable app among music lovers. It offers amazing ease of use, impressive song library of 30 million tracks and freemium features. The app offers free music streaming with $9.99 monthly subscription that lets you save unlimited songs offline. With its Chromecast support, users can cast their favorite music to their TV set or sound system to leave you with unique music experience never offered by your dwarf smart phones. The addictive features of Spotify include Party DJ mode, pace-matching Running feature and personalized Discovery Weekly playlists. 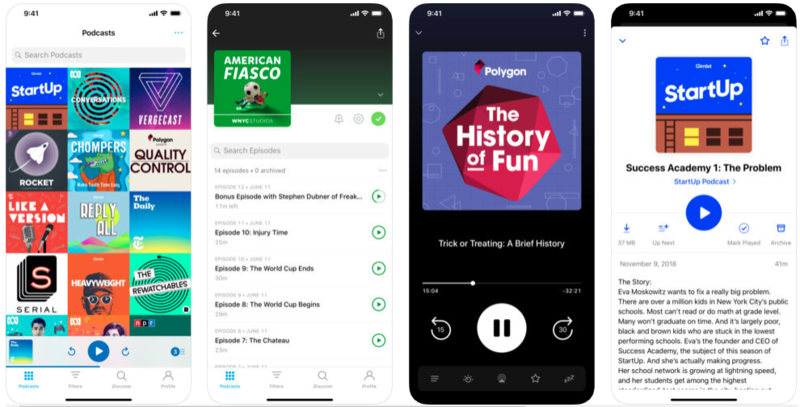 Giving you powerful listening experience, Pocket Casts emerges as the best in the category of podcasts for true podcast fans. It has Chromecast support and has innumerable options to subscribe to. It supports both video and audio podcasts and has enriched your listening with unique features such as syncing, dark theme, playlists, auto-downloading and many others. However, you don’t have a free version and you will still need to buy it even if you intend to test it though there is a refund system in place. AllCast is a versatile media player app by ClockWorkMod that can allow users to stream their videos, music and photos from their gallery on TV using Chromecast. It also supports other streaming devices like Roku, Apple TV, Xbox and many other smart TV equipment. 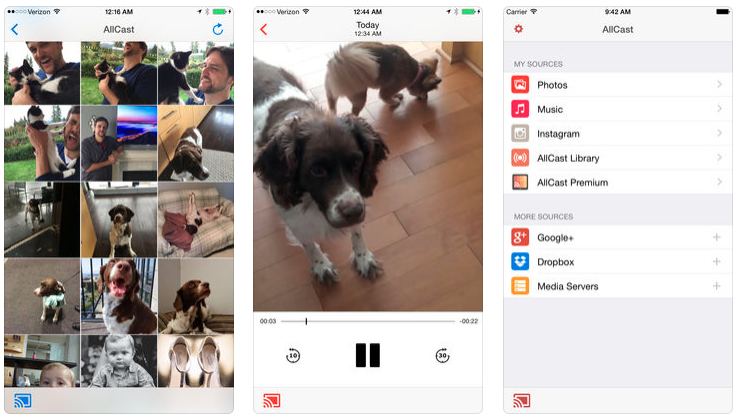 Apart from local storage, AllCast also plays all content from cloud storage like Google Plus, Google photos, Dropbox, etc. Its free demo allows users to try the app for viewing videos and images for 5 minute while the full-fledged premium experience costs you $4.99. There is rarely anyone in the world who has never tasted the power of YouTube in their life. 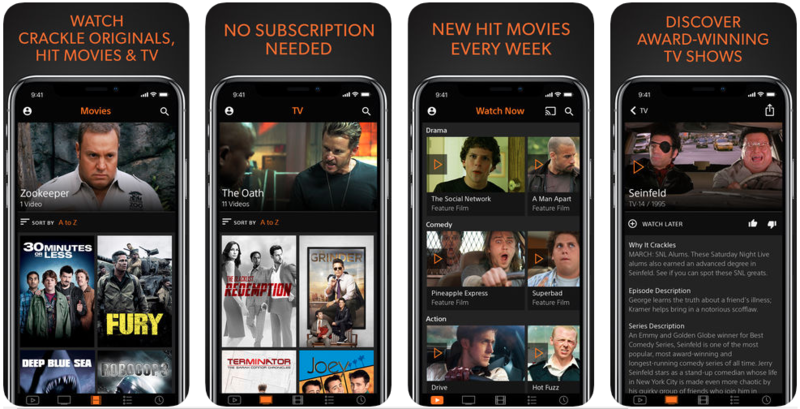 This dominant video-sharing network app gives you the power of mobile streaming, playlist, video search, chat, personal channels, paid movies and many more advanced features. The Google’s flagship app gives you the advantage of Chromecast support to enjoy YouTube videos on wide-screen of TV for enhanced vivid experience. 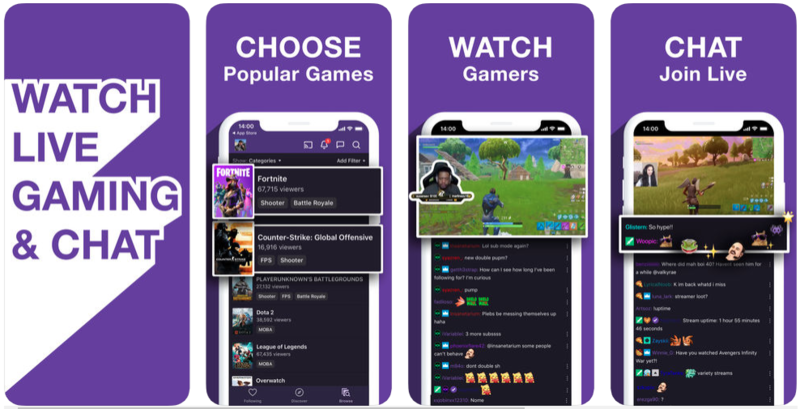 YouTube is progressively expanding its services, now adding more specialized apps such as YouTube Music and YouTube Gaming to capture the widest of audience. People who are a big fan of new and classic movie titles, they can buy or rent them on Vudu. The unbeatable Vudu offers tremendous Chromecast support enabling TV viewing of your favorite movies. The service is also equipped to give you access to your stock of UltraViolet movies and ability to share with up to five friends. For this facilities, Vudu has joined the list of best Chromecast apps. TEDtalk videos are quite popular for its ideas worth spreading and ideas that can transform your life. 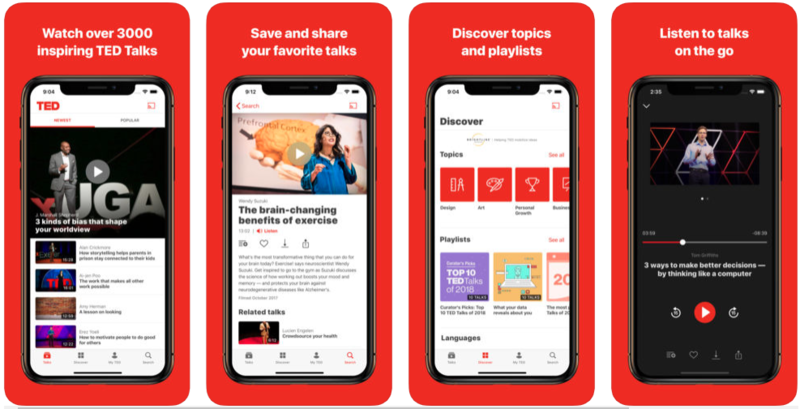 The official TED app contains thousands of videos of TED conferences that you can easily download and view. These videos feature the best and inspiring ideas most talked about in design, art & aesthetics, philosophy, philanthropy, intellects and more. Chromecast app takes your level of grasp from touchscreen to big screen where streaming is enhanced for much better experience. Crackle hosts rotating selection of TV shows and movies with ad-supported streaming content. Along with old TV show episodes, it also offers its original program content such as Chosen and Comedians in Cars Getting Coffee which is presented by superfamous Seinfeld standup comedians. Mobile or Chrome browser users can now cast Crackle entertainment to Google Chromecast. Crackles frees you from paid subscription and makes for a cool free option with content focused on Sony’s offerings. Videostream is a powerful video streaming app that supports Chromecast functionality to play videos straight from your desktop to TV. 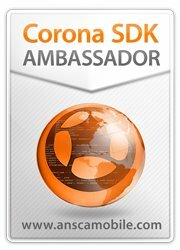 It squeezes out the best of laptop or Desktop’s technology to support over 400 video and audio with subtitle through necessary transcoding. There is a wave of watching other people play video games, which is perfectly captured by Twitch. With Twitch, you can watch real-time eSports championship matches and everyday plays of Bloodborne as they go live. Twitch makes you watch your games on PC, PS4 or Xbox One. This Chromecast app drowns you in its streaming personalities, lets you watch the game of your friends or discover a new game that interests you. Tricky Titans is fun way of exploring cute graphics, witty bluffs, strategy making and diplomatic attitude in multiplayer gaming experience on TV via Chromecast and smartphone or tablet right on your couch. You can indulge in this thrilling game competition played with up to friends. Players are competing giants protecting their village from Titans by defending or attacking them or charging for their next action strategy. The player enduring the least damage at the end of rounds is crowned as the winner. Chromecast offers access to many individual sports league apps and if you already have an existing cable subscription, you can avail ESPN sports on TV, from Android or iOS app. All you need is to have a subscription to a cable package that includes ESPN, and you can watch free WatchESPN app. As you use this app supported by Chromecast, you can watch live TV from eight ESPN networks. Plus, you also enjoy access to recorded shows and highlights of missed matches on demand. This is our handpicked list of best Chromecast apps for iOS and Android devices. The list is subject to trending waves and popular tastes in the world of mobile apps. We would like to know which app would resonate most with you via comments. We might have missed out on a couple of your favorite Chromecast app while creating the list. We appreciate your comments to let us know about those apps.